Wishing you a safe, healthy and prosperous 2019. Please take your time and have a good look around our website - find out what we can do for you. And, we just have to add our congratulations to J L Pawley. Just published YA SciFi author, (and our daughter - so proud)! A huge amount of work has paid off for the publication of her second (in a series of 4) novels. Look for "Generation Icarus: Air Born" and Book 2 - "Take Flight" in all good bookstores and, and online. Second print run of Book 1 is also now available. (pssst - ask me quietly - I have some copies I've bought specifically to give to our clients - while stocks last)!! 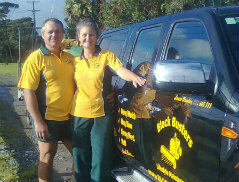 Block Busters Lifestyle Maintenance Ltd began operations in March 2006. 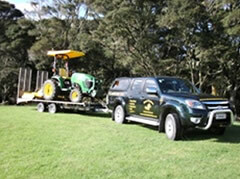 We provide tractor based agricultural and general rural services for NZ Lifestyle Block, Small Holding, or Acreage owners. Since then, we've grown so we now provide a wide range of services beyond the "lifestyler" - i.e. from recovering a neglected suburban section, maintaining the appearance of full sub-divisions while they are being marketed, and even manicuring fine lawn and grounds for the odd Mansion here and there! We provide "one-off" and scheduled maintenance. 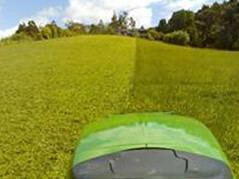 We can handle steep slopes, whether mulching or mowing, gorse or fine lawn - we have the machinery and expertise you need. However, our founding and primary goal remains: "We help recover, maintain or improve your slice of paradise, so you can enjoy it, rather than slave over it!" Feel very welcome to Browse our Services, Contact Us , or Find out more about Us. FOLLOW US ON TWITTER we'll "tweet" when new information is added, (like rainfall data updates), or special offers occur, or anything else we think you might be interested in! All Block Busters Lifestyle Maintenance staff undergo intensive training in Agricultural Safety. All staff have a National Certificate in Safety and Hazard Identification for Tractor, Chainsaw, Agrichemical handling and application, and safe work practices in a Rural Workplace. We can help you maintain, or even re-build, your dream. We understand the many jobs, (little and large) that can make your Lifestyle Block a real challenge. Let us help you keep your rural paradise looking great - so it really gives you the pleasure you originally bought it for.